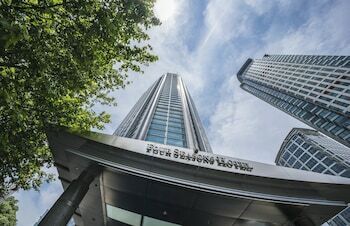 A stay at Four Seasons Hotel Shanghai places you in the heart of Shanghai, within a 10-minute drive of Jing An Temple and Shanghai Museum. Featured amenities include complimentary wired Internet access, a business center, and express check-in. Event facilities at this hotel consist of conference space and a meeting room. Self parking (subject to charges) is available onsite. With a stay at Peking University International Academic Center in Qingdao (Shibei), you'll be within a 15-minute drive of Tsingtao Beer Museum and Qingdao Zoo. Free self parking is available onsite. With a stay at Rich Hotel - Beijing in Beijing (Xicheng), you'll be within a 15-minute drive of Tiananmen Square and Forbidden City. Self parking (subject to charges) is available onsite.